There are countless versions of Pico de Gallo salsas. Their trademark is having ingredients that are fresh rather than cooked, and diced and chopped rather than pureed. This is the most common and well-known version. It is also incredibly colorful! Place all of the ingredients in a bowl, toss well and serve. The salsa can be prepared up to 12 hours ahead of time, covered and refrigerated. And it can be eaten with anything you want to try it with! I know there’s something that you like a lot but can’t think of the name of the food that you said is perfect for summer. You got it from the little eateries that you walked up to on one of the season’s on patti’ s Mexican table. It was put into a cup too I’ve been wanting the recipe to make. Oh gazpacho….https://patijinich.com/recipe/morelia-style-gazpacho-salad/ Great for summer! Hey Pati! I am from the Philippines and I really love your show.. Please feature Juju more. Hi Toni! I’m so happy to hear you like the show all the way from the Philippines. Juju will be in this upcoming season with his favorite…chocolate. I would kill for great pico. I always ate the cooked which was passable, but when I discovered pico…OH MY LORD!!! I eat it on everything and even just out of the container off a spoon. Easy to make and some stores have it as wel in the fresh food refrig. cases, but its a tad pricey. Pati I love your recipes! I just love your tv show, your family. and the simple yet delicious way you prepare your meals. I can’t wait to try the moletes (sp), it looks so delish! I think there are as many recipes for this as cooks so it is hard to make it bad! ¡Muchísimas gracias por compartir tus recetas! Tu programa es muy animador y a nuestra familia nos encanta tu entusiasmo no solo por la comida pero también por tu cultura. Siempre agradecemos cuando nos “llevas” a visitar distintas parties de Mexico. Just had to let you know I live at the edge of my seat for each new episode! I love your cooking show! and such wonderful recipes!! thanks for the great info!! Aw, Peggy, thank you for tuning in! Pati, I just wanted to let you know I made your Pico De Gallo Salsa for my daughters Mexican themed wedding reception this weekend and everyone just loved the salsa and wanted the recipe! Thanks for making me a hit! Since learning that much of the flavor in a tomato resides in the seeds and jelly, I wouldn’t dare omit them. It really depends on whether you want a tasty dish or a good looking one. I prefer flavor. I’m surprised there isn’t a recipe listed in this category for ordinary red sauce, the kind that is typically served in Mexican restaurants with chips. I realize, like Pico de Gallo, there are many variations, but I am curious to see your take on it. I thoroughly enjoy watching your show for two reasons: I love Mexican food, and you are very pleasant and entertaining. In fact, I am not a big TV watcher, but I go out of my way to watch your program. Thanks so much for sharing your knowledge and being such a great teacher! 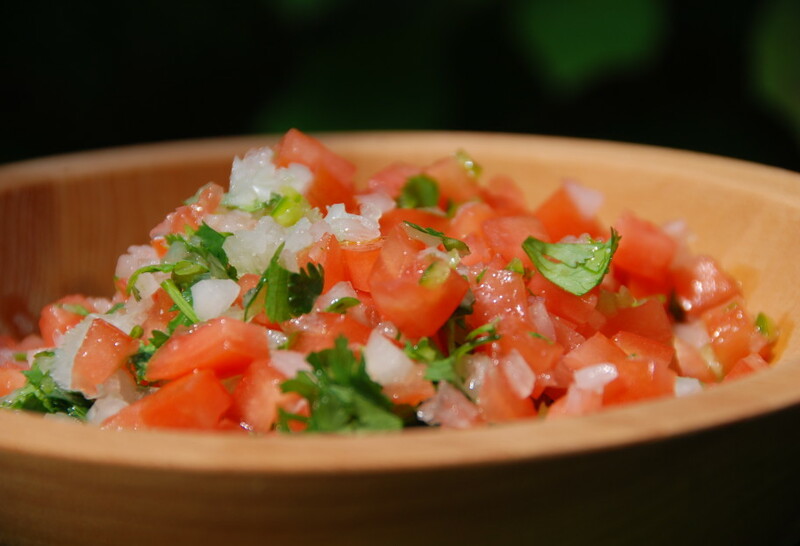 We love pico de gallo, especially that made by Senora’s restaurant in West Chester PA. But we can’t get out there nearly as often as we’d like, so I want to try making it ourselves with some of the wonderful fresh tomatoes at the farmer’s market. Do you have any suggestions for freezing it? We find that it starts to ferment after about a week or so and would like to be able to have some even after the fresh tomatoes are gone. Thanks! Hola Lisa, I am so happy you all love Pico de Gallo. I do not recommend freezing it, because part of the beauty and taste of the Pico de Gallo is that it is completely fresh. If you have anymore questions, just let me know! I moved to California from Italia when I was 17 years old and missed my home country and culture very dearly. I knew nothing of Mexican food nor their culture. Luck had it I had a neighbor named Mama Cuca who I grew to love so much. She spoke no English and I was so poor at it as well but we understood each other. She introduced me to the way to eat and cook Mexican food, the best gift I ever had in my life. I came across your show on PBS and it was like having my Mama Cuca again. Thank you for continuing to show me your country and cuisine with grace. What kind of tomatoes do you use for this recipe? Como esta? My mother loves, pico de gallo! We grow our own tomatoes out on our back porch, and they are wonderful in the pico de gallo. Home-grown vegetables taste extra good! I, strangely enough, like the smell of pico de gallo… Hmmm, I am strange, aren’t I? Finally, awesome, easy to follow recipes that are wholesome, flavorful AND healthy! YOu pack so much flavor in your recipes!THANK YOU so much for having such an awesome program. I hear there is going to be a cookbook by you coming out…can I put my name on a list to buy it? Hello Pati, I saw your show today on PBS for the first time. I may not have Mexican heritage but I love the food. It was interesting watching how you made wraps with the banana leaves, I would have never thought to bake with the leaves! I think everyone should be open to new ideas on cooking. Love how you share your recipes with everyone too, going to try some of them out on my family. Homemade is always better than going out to eat, best part is left overs for the next day! I agree that there is no meal quite as special as a homemade meal! It brings me great joy to sit down for a meal I am proud of with my family, and it is even better when they all enjoy it! Keep cooking, and always know I’m here to answer any additional questions you may have. Caught the end of your show today on PBS. You were so delightful, I went to your website. Watched the clip of your show with Paula Deen. It was as enjoyable and informative as I hoped. I love Paula and find you enchanting. I look forward to watching you on tv and checking out some of your recipes. Mary Jo, You are too incredibly kind to write such a complimentary post. I was truly lucky to work with Paula Deen. She is a wonderful woman and she is such a great teacher. Thank you for watching the show and looking through my website. I promise to keep working hard to always give you the best recipes I can! Saw your show for the first time tonight on PBS and went to this website. I read some old posts which said you were writing a cookbook. Is it finished? If so, how can I purchase it? I cannot wait to make your Chilorio Burrito. Muchas gracias for sharing your Mexican heritage and cuisine with all of us. Your enthusiasm and passion is contagious!!! Hola Gayle, Your comment was so lovely. I thank you from the bottom of my heart. I’m working on my cookbook now and it will be available in 2012. I promise that it will be filled with treats galore! Hi Patty, I’m Puerto Rican and I also part of my family comes from Mexico . I idolized my grandmother who was from Mexico City who was a great artist, and grandmother in Fayetteville,Ark. I was only 12 years old when I could remember her cooking with eggs, tortillas and sausage which is still carried on today with my girls. I, unfortunately never further extend my learning how to cook mexican food that I love! I’m glad that I get to learn on TV how it is done! It means alot! My young 14 yr old daughter and I hit the kitchen and started cooking one of your receipes with tomatillos. It was great cooking with my daughter and creating a dish my grandmother would have been proud of! THANK YOU! My mother taught me how to cook our Puerto Rican dishes, but you have taught me from my other ancestory side. I’m not a great cook, but you make it look so easy! Muchos Besos! Hola Sharon, You MUST give yourself more credit. Half the battle is just getting into the kitchen. I can’t tell you how honored I am that you are cooking some of the recipes with your daughter. Those will forever be treasured memories that you will both share. And hopefully one day, she will do the same with her daughter! I am also sure both of your Grandmother’s would be extremely proud of you. I hope you and your daughter continue to cook together, and create many more wonderful memories! Came across your show on TV and love it, love your refreshing take on Mexican food. Hi Bibi, Thank you so much for your wonderful comment. I think the array of ingredients often required for Mexican food presents an obstacle for many people. I hope my show and website will offer a way to overcome this obstacle and allow more people to enjoy the beauty of Mexican cooking! Ilike the receipt Pollo con tomatillo, chile chiplote y piloncillo. Was awesome!!!! Hi Pati. I was just wondering why in the recipe it calls for an optional 2 tbsps of olive oil? I’ve noticed other chefs that have done that as well and I always wondered why. Wondering if I’m missing out. Thanks. LOVE your site by the way. It is because while many cooks use oil for their Pico de Gallo, there are plenty that don’t! And both versions are equally delicious and valid. So it is up to you, to which you like best, or maybe some times you feel like adding the flavor of the olive oil and mellowing the taste of the lime juice, and sometimes you may want to have them more intense, without the oil.